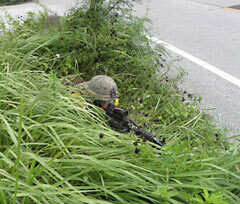 On August 11 at Katabaru, Matsuda Ward, Ginoza, four U.S. soldiers were seen lying in the grass on the roadside pointed their weapons toward the road. They were likely taking aim at amphibious vehicles crossing Route 329 from the shore and moving towards Camp Hansen. According to the Northern National Roads Office that area of the sidewalk is not within U.S. facilities. Nago Municipal Assembly member Takahito Oshiro witnessed the scene. He said that the soldiers took up positions at four points on the sidewalk and pointed their guns at the road when seven amphibious vehicles crossed Route 329. He explained that the vehicles had landed on the coast of Katabaru from Camp Schwab and went into Camp Hansen. They damaged part of the curb when they crossed the road.